Up until this point we've been doing mostly local adjustments in Photoshop and Elements - but that's not why we bought the software. 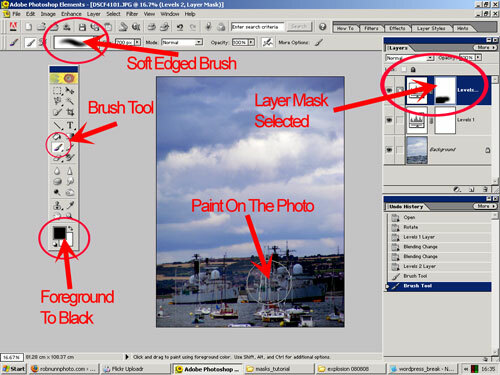 We want to make changes to specific parts of our photographs, independent of the others - these are local adjustments, and we're going to be doing it in the easiest way - by painting on Layer Masks. When editing our images, we need to realise that the viewers eyes are drawn to areas of high contrast and bright objects, so lets get going! 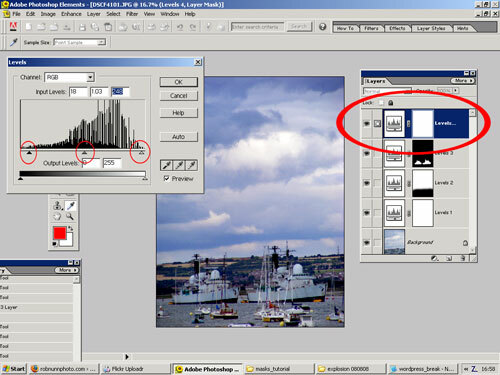 All we're doing with this adjustment layer is to adjust the overall contrast slightly. I've used the black-point colour picker on the bottom of the warships, then moved the sliders slightly. I'm not worried about the sky or the Warships, just the overall look, and the background hills. All I've done is slide the black slider in a bit, made the mid-tones a bit darker, then brought the right-hand highlights slider to the left a bit. Now the clever bit - we're going to paint on the layer mask to hide this adjustment on the ground! Layer masks are wonderful. 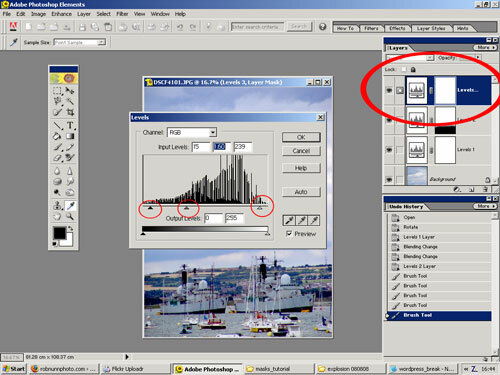 They are automatically attached to any adjustment layer you create, and they control which parts of adjustment layer effect the layers below. If its all white, all of the adjustment is let through. If its black, none of it. 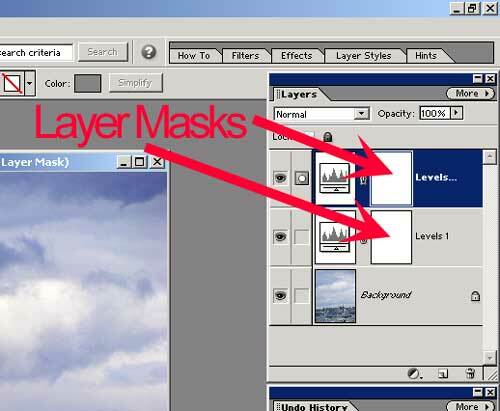 Click on the mask of the levels adjustment layer we've just created for the sky, then press "ctrl I". The mask will invert, turn black, and the sky will go back to normal. 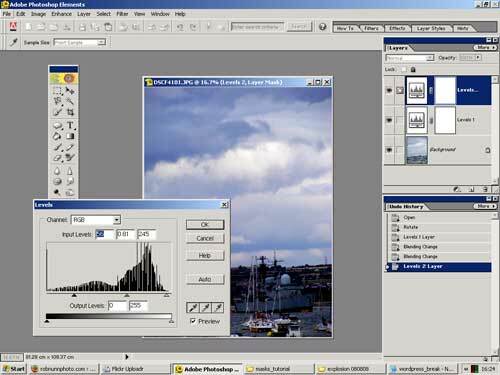 Now press "ctrl I" again, and the layer mask will return to white, letting all of the adjustment through. What's really clever is that we can paint on this mask, using the brush, in black, to block areas of the adjustment layer. 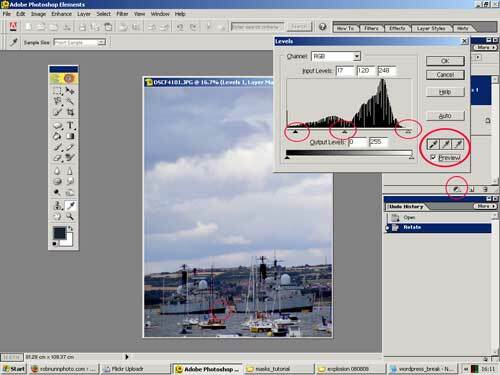 Make sure you've clicked on the sky mask, then select the brush tool (with a largish soft-edged brush), make sure your foreground colour is black, then paint over the bottom of the picture. Be careful near the edges of the sky - if necessary choose a smaller brush and zoom in. (Ctrl + to zoom in, Ctrl - to zoom out). If you make a mistake, just change your brush to white, then paint over the mistake. Easy! Now I'm going to lighten up the Destroyers, so I'll add another Levels adjustment Layer, and adjust it until I'm happy with their lightness and contrast, ignoring everything else. Now we're going to make sure this adjustment only applies to the Destroyers. Select the Layer Mask for the destroyers by clicking on it, then "Ctrl I" to hide everything. 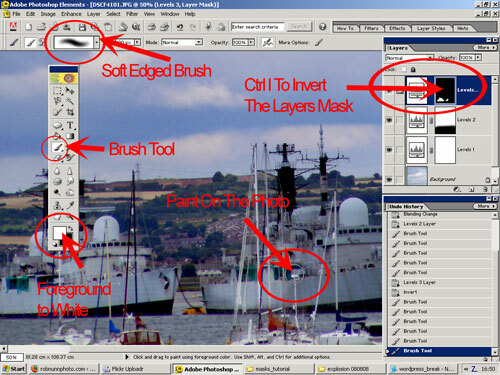 Thens its simply a case of selecting a smaller soft-edged brush, changing the foreground colour to white, and painting the adjustment on to the Destroyers. You now know how to "Paint in Light!" Again, for trickier parts zoom right in (ctrl +) and switch to a smaller brush (use the square brackets on your keyboard). 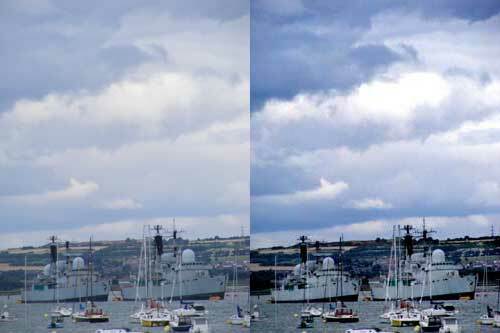 If you make a mistake, switch your foreground colour to Black and go over the mistake. If any of these adjustments look too strong, simply select the opacity of the layer (top right of layers palette), and slide it down. Now just "save as" - a .psd if you want to keep the layers for editing later, or as a .jpg if you want to upload it or email it to others. I've probably gone a bit over the top with this image - the sky doesn't look too natural, and the Destroyers are a bit bright, but it should have given you enough ideas to use Adjustment Layer Masks on your own image - local editing!